A pair of leaks have hinted that Apple begin selling unlocked iPhones at U.S. Apple Stores on Wednesday and add voice recognition support from Nuance in iOS 5. Update: Chronic has issued a correction that unlocked GSM iPhones, not new MacBook airs, are coming to U.S. Apple Stores on Wednesday, claiming his source "mixed up part numbers." According to the rumor, the part numbers for unlocked iPhone 4 models are MC603 (16GB, Black) MC604 (16GB, White) MC605 (32GB, Black) MC606 (32GB, White). Twitter user Chronic, who has been a source for leaks on Apple products in the past, first noted late Saturday that his sources have "100% confirmed" a Wednesday release for a MacBook Air update. Early on Sunday, Chronic added that Apple Store displays will be updated on Tuesday night to launch the company's annual Back To School promo alongside the new MacBook Airs. The leak comes on the heels of an exclusive AppleInsider report that Apple is scheduled to begin mass production of revitalized MacBook Airs this month with an initial build volume of roughly 400,000 units. Though Chronic has yet to hear specific details on what changes will be made to the new MacBook Airs, Apple is expected to move the notebooks to Intel's 32-nanometer Sandy Bridge architecture via the chipmaker's ultra-low-voltage Core i5 and Core i7 chips, which feature between 3MB and 4MB of Smart Cache and support a theoretical maximum of 8GB of internal system memory. Rumors of a June launch of Sandy Bridge-powered MacBook Airs emerged in February. Apple revamped the thin-and-light notebooks in late 2010, adding an 11.6-inch model to the lineup for just $999. The laptops instantly became best-sellers, with one analyst reporting that they were "flying off the shelves" over last year's Black Friday weekend. Chronic also posted a pair of screenshots of an alleged internal build of iOS 5, displaying settings for "Nuance Dictation" and "Nuance Long Endpoint." 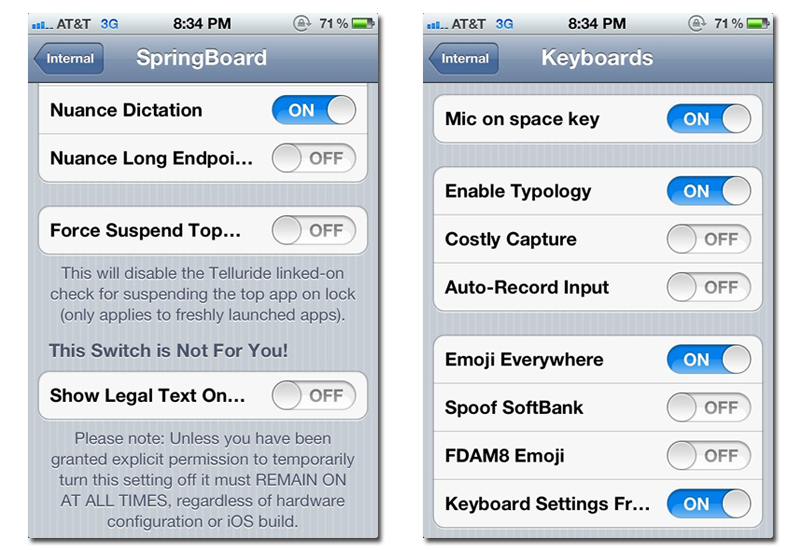 In addition, a "Mic on space key" may provide further evidence of the rumored voice recognition support in iOS 5. The features are reportedly disabled for the developer build of iOS 5. In May, it was suggested that Apple would deepen its relationship with Nuance, which makes voice recognition technology, in iOS 5. However, Apple neglected to demonstrate voice control features at last week's Worldwide Developers Conference. After Apple's keynote, several sources claimed that voice features weren't ready in time for WWDC. Apple has been expected to add complex voice command features to iOS since it acquired Siri, the developer of a voice search app that supported open-ended questions, last year.